This has been a long time coming... The last time I had an In-N-Out Burger, Bush was still in the White House, Favre was still a Packer and Pluto was still considered a planet. I guess for almost all, it's an improvement. Yes, it has been long. 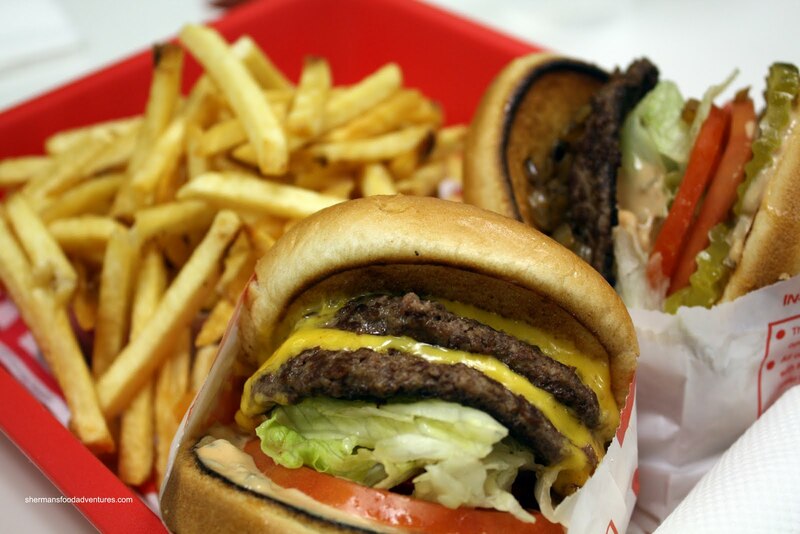 I've been yearning for an In-N-Out Burger as much as GM needs people to buy their cars. It's been 3+ years of the In-N-Out B"urge"r. I was really wasn't all that hungry since I was spending every waking hour chewing. But I really did have the urge! I wish I could admit I went for In-N-Out reluctantly; but alas, I was more than a willing participant. Really, what makes this fast food place so special? After all, it only serves burgers, fries and shakes. That's it. Well, the way that I see it, the less options, the more they can concentrate on making what is on the menu right. Another key component to their success has got to be their commitment to freshness. 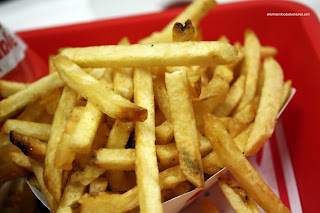 Not only are their meat fresh, so are their fries, they are cut right before they are fried. Combine this with very reasonable prices and it results into an almost cult-like following. Cable Car Guy wasn't exactly hungry, so he went for the simple Hamburger done "Animal Style". Animal... what? 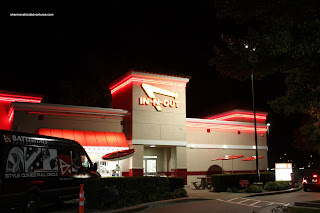 You see, there used to be this secret menu (which is not really all that secret anymore), where you can get the burgers and fries Animal Style. For the burger, it means stuffing it with lettuce, tomatoes, pickles, grilled onions and sauce. For the fries, it's much of the same thing, except there is cheese. I didn't want Animal Style since I was not that hungry and went for a plain Double Double (yes, I do realize this is a total contradiction). One bite into that soft toasted bun, freshly cooked patty and sauce, I was in heaven. What a tasty burger (said a la Samuel L Jackson)! Cable Car Guy got his fries done "well", which means they were fried a bit longer resulting in more crispiness. Fries are solid; but the burger is the star. I only wish that there were more locations of In-N-Out because the closest location to me is in Redding, CA and that ain't exactly close. i was at the in n out burger in las vegas last week..., took a walk from ny ny to get there. the 1/2 hr walk was worth it. had the 3x3 with chocolate shake; boy was i stuffed. the walk back took 45 min lol. had to take the deuce back to the hotel. it's one of those places you hear about and have to try. 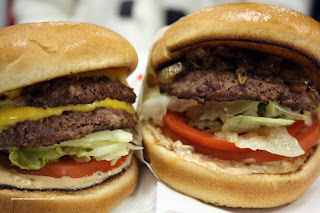 The first time i tried an In'n'out burger was last year in Vegas. A friend that lives there said i had to try them out. I actually took a cab to the drive thru, the cabbie was great. She ordered for me, a double double animal style, fries and shake. Was the best burger i had tasted in 20 years. Well the next trip to Vegas i rented a car specifically so i could go to In 'n' out. I'm kinda glad they don't have them here in Vancouver B.C. as i'd pack on the pounds. To say they are very tastey is a huge understatement! I hear ya, they are indeed very good! Yes, I'd be in big trouble if they opened one up here!